"If you work with web pages and databases, AppServ will mount a complete server on your computer so that you can perform tests." 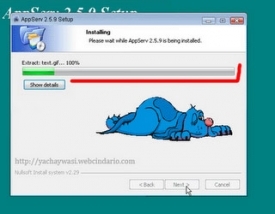 AppServ is a program which installs and configures automatically a web Apache 2.2.4 server with PHP 5, MySQL 5.0.45 and phpMyAdmin 2.10.2, which is what allows web designers to test the web pages that they are currently designing on their local systems before publishing the content to the Internet for the world to see. The installation process is relatively simple when you consider that it is an all in one installed for your compilation of a web server. The great advantage of this program is that once installed it gets automatically configured for being able to use it right away, saving hours of tedious configuration. This makes it extremely useful for those who are testing out their own content with in the home or local network. You could also, essentially, use this as a local web server for delivering your content from your home connection rather than using a dedicated host for your content - saving your money. AppServ is regularly updated to contain the newest PHP, MySQL, and phpMyAdmin installations for web servers that are available for web hosts. This makes it ideal for those who want to run a free and easy web server from the home on their own home Internet connections. AppServ is a free to use application without limitation that you are able to use for just about anything you could normally use for web content. While you are able to configure the server to your liking, you do not really have to if you are on a local network. Though, if you plan to host a web server from the home, it would be best to edit the information of the root information to make it a lot more secure for serving on the Internet.